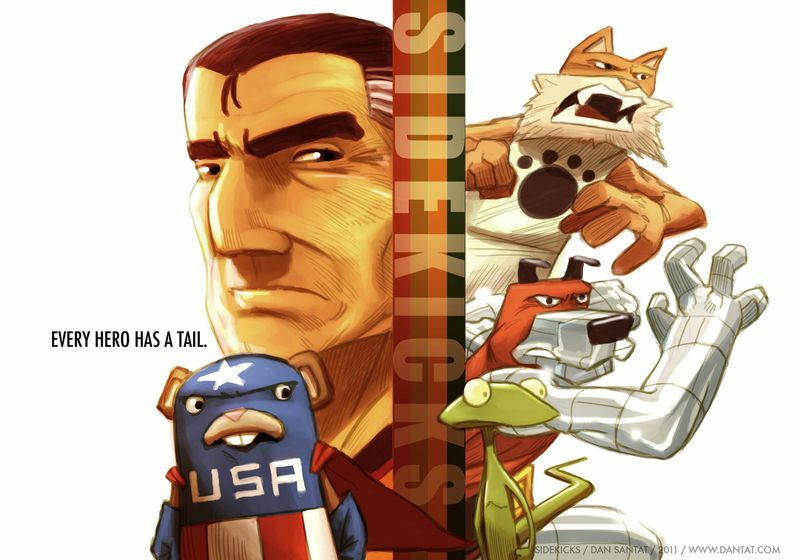 Dan Santat’s SIDEKICKS is an awesome book. The author illustrated a book for my own mama Ayun Halliday. The book was “Always Lots of Heinies at the Zoo”. Children love that one. 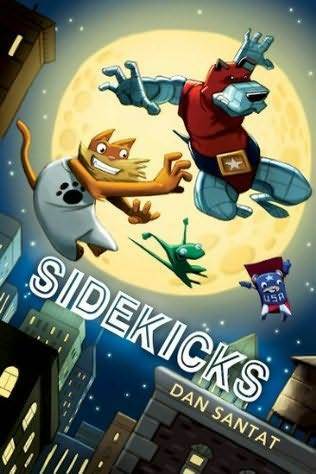 SIDEKICKS is the story of a superhero named Captain Amazing whose pets, Fluffy the Hamster and Roscoe the Dog, are sentient. Captain Amazing has done his job for a long time and now is getting old. His old sidekick/pet, Manny/Static Cat, ran away years ago and Captain Amazing needs a new sidekick. Roscoe sees his chance to use his ability to become metal to become more close to his master. Fluffy doesn’t have a power so he has almost no chance of becoming Captain Amazing’s sidekick. Meanwhile, Captain Amazing had purchased a chameleon online. He named it Shifty. Roscoe and Fluffy are apposed to the idea at first. Then Fluffy gets used to the idea. Fluffy wants to be a superhero real, real bad. So he ventures out in an American superhero outfit to catch a raccoon who stole an ipod. Right before Fluffy catches the raccoon, he scurries away. when he starts to leave he finds himself cornered by 1, 2 and 3 cats. Apparently Shifty had followed him and fell from his hiding spot. A low growl is heard and a shadow scares away the cats, Fluffy recognizes the shadow as Manny. They bring Manny his favorite toy, Nummers. Manny invites them to an underground bar of sorts. Manny gives them a few tips about crime fighting. With their new information, they take care of a hippo who was eating all the food. Meanwhile, Captain Amazing is starting to lose his reputation. A new superhero named WonderMan is rising to fame. Also another hero is up. Roscoe is fighting crime under the name of Metal Mutt. The day of the auditions has come. Superheroes line up across the city to have a chance to become Captain Amazing’s sidekick. When Wonder Man hands in his application, Captain Amazing chooses him. The artwork is shiny, bulgy and colorful. It looks somewhat like plastic instead of paper. It looks pretty cool in my opinion. You're the man, Milo! I'm glad you liked the book and thanks for the kind words. No problem, Dan. I liked the book after all. Cool! You should become an indiebound affiliate and then if people click and buy the book you'll get a cut but they'll be buying from cool local places instead of evil Amazon. I'm gonna be a loyal reader cuz my kid is totally into the graphic novel thing. Thanks. I plan to make many more so be prepared!